Teresa Budworth, Chief Executive of the health, safety and environmental examinations body, NEBOSH, explores three key aspects of oil and gas safety - compliance, critical issues and competence. Disaster can strike at any time in the oil and gas industry, and occasionally it does. In fact, over the past 30 years there has been a large scale fatal incident every two or three years. 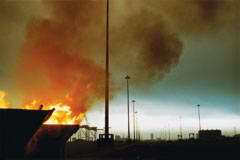 Oil and gas incidents occur throughout the world, both offshore and onshore. The Deepwater Horizon oil spill in the Gulf of Mexico two years ago led to the deaths of 11 men working on the platform and caused huge environmental damage. In 2007, the Usumacinta jack-up fire cost the lives of 22 workers, the same number who died in the 2005 Mumbai High North incident, when a support ship collided with a platform in the Indian Ocean. Onshore disasters can cause even greater loss of life. As many as 230 people were killed in the Democratic Republic of Congo in 2010 when an oil tanker overturned, exploded and set fire to parts of a village. A pipeline explosion in Nigeria the year before caused 100 deaths and the Chongqing gas blow out in China in 2003 killed 243. A big question for the oil and gas industry is ‘What more can be done to reduce the likelihood and the outcome of these major incidents’? I put this question to Douglas Clark, former Safety Engineer, Knowledge Manager and HSSE Issues Adviser with an oil and gas major. A graduate chemist, Clark began his oil industry career in 1976 as a production chemist, both on and offshore. His career changed in 1991 when he became responsible for occupational hygiene - the control of hazardous substances, noise, radiation and other health hazards. From there he took on various health, safety, security and environmental (HSSE) roles up until his retirement in December 2011. He is a highly respected oil and gas industry HSSE expert. In answer to my question, Clark focused on three key areas - what I’ve called ‘the three Cs‘ of oil and gas safety: Compliance, Critical issues and Competence. Major companies have experts with years of experience who know exactly how to carry out high risk work safely. They cannot be everywhere, however, so they use their expertise and experience to create systems of work which, if applied correctly, allow work to be carried out properly and safely in the field. He explained that the best safety systems in the world will never work if they are ignored or misunderstood by management and workforce. A vital aspect of any successful safety system is the way it is communicated. Several years ago, it became apparent to Clark and his colleagues that their carefully prepared and highly detailed HSSE management system (HSSE-MS) manuals were not working. Incidents and audits revealed that while procedures were in place, they were not always being followed. He explained that the issue was tackled by dealing with four important areas: commitment, structure, content and language. The first step here was to get both the Operational and HSSE departments behind the idea that the HSSE-MS manuals were not being applied properly and that simplification, rather than addition, was the answer. A new, simple, relevant control framework for HSSE was needed. “That was tricky, because it went against their natural instinct that more instruction is better, and many of them had been involved in writing the old manuals and had made a specialism of interpreting them,” Mr Clark said. “To get this buy-in, we got a high level - Vice President - sponsor, and a dedicated project team. We set up a steering group with representatives from each business and region, and they nominated their own ‘Subject Matter Experts’. The Standards, Manuals and Specifications are all mandatory, giving requirements which have to be met after a given date. The subjects of the manuals were carefully chosen to be cross-group, and were “the real HSSE issues which cause us pain,” Mr Clark said. In addition, there are six manuals which cover specific problem areas, such as Asset Integrity/Process Safety, Contractors, Projects and Transport. Each manual section gives about ten ‘must do’ requirements for that topic - basic things that have to be met, used or provided. This was perhaps the most important and difficult area to achieve. It can be hard for anyone who is technically minded and has a great deal of expertise to get messages across to an audience that is lacking in the same knowledge. For each requirement, the general form is ‘Do something in a stated way’. In order to clarify who is responsible or accountable, these instructions are prefaced by ‘A Position/Title is responsible for Requirement X’. As a result, someone in a named position is made responsible for seeing that something critical is done in a given way. Clear and simple. In many respects the Oil and Gas industry is similar to other industries when it comes to health and safety. People suffer as a result of slips, trips, falls, workplace stress, manual handling and other issues. These injuries and ill health effects cost the oil and gas industry dearly, just as they do for construction, manufacturing, transport and other sectors. They need to be managed -and managed well. There has been a tendency in recent years for the industry to focus in on what can be measured when it comes to HSSE. So slips, trips, falls and other fairly frequent incidents get recorded and resources get pushed towards reducing them. While this is not a bad thing, it can lead to complacency around the ‘nightmare, big bang event’. Mr Clark said: “If you ask the normal Installation Manager about how his or her current safety performance is looking, the response will probably be in terms of Lost Time Injury (LTI) frequency, days since the last LTI on the location or such like. He added: “While operational and personal safety symptoms like slips, trips, falls, cuts and backaches are regrettable, they are not the side of HSSE which keeps managers awake at night. “There is one thing that can bring a major oil and gas company to its knees - a loss of containment which results in an explosion, a major hydrocarbon spill or a toxic cloud reaching the neighbouring communities. Since these events are rare, historical data is a poor predictor. Mr Clark said: “Process safety depends on asset integrity. So the essence of process safety is good design and maintenance to keep the plant in tip-top condition, and guarding systems to detect leaks and upsets quickly and close them down before damage is done. “We use the bow-tie model to test the various ways that a release could occur and analyse the controls in place to stop each release path. We then look at each escalation path between the potential leak and an explosion or environmental disaster, and we analyse the recovery measures available. The role of gas detection is critical. Gas detection operates at three levels. Personal gas detectors are matchbox sized instruments worn on the coverall. They usually detect a single gas, such as hydrogen sulphide, and alarm when a toxic level is detected. The worker escapes from the area and a response team with suitable breathing equipment investigates. Portable gas detectors are shoebox sized instruments placed in the work area. They usually detect three or four gases/scenarios - explosivity, oxygen depletion, hydrogen sulphide and possibly carbon monoxide. Again, the aim is to get the workers out of danger and a team in to fix the problem. Finally, there are fixed detection systems which are hardwired to the control room and will shut the plant down if a release is detected. The final area Clark wished to highlight in the field of oil and gas safety was that of competence. We can get a little bogged down with the meaning of competence in health and safety, so let’s start simply with the Oxford English Dictionary definition of the word: the ability to do something successfully or efficiently. Competence is one of just three tools any manager has in the workplace for ensuring that work is done properly, the other two being instruction and supervision. The balance of the three depends on the nature of the workforce and the situation. If the workforce is very competent, less supervision and instruction is required. If competence is low, close supervision and detailed instructions are necessary. If the work is high risk, all three may need to be raised. We make competence assessments all the time. When we choose a plumber or a shoe repairer, we look at qualifications, remember past experiences or simply ask around. A supervisor does exactly the same thing. When he or she chooses a member of the team to replace a pump or weld a pipe joint, they will consider qualifications - is the person a qualified welder? ; experience - has the person done this before and how well did it go? ; local knowledge - does the person know how we do things here? ; and HSSE awareness - does the person have the right attitude? Balancing these, often subconsciously, the supervisor will choose one person over another, or use the other with extra supervision. The decision hinges on knowing a person’s competence level, the competence level that the job requires and the options for filling a mismatch. Mr Clark said: “For well established teams, the supervisor knows the people well, so this is easy. Major operators also have formal competence assurance systems for their own staff, with set competence requirements for each skill area, formal assessment against these requirements, and training to fill gaps. So if a new person joins the team, their competence is recorded and is reliable. “With increasing reliance on a contractor workforce, the manager or supervisor has less personal knowledge of the individuals. This is worst with specialist contractors, where the supervisor may not even know the detail of what the job requires. The contractor company may have its own competence assurance system, but it may not align with the operator’s one. “For these reasons, there is a strong move towards external accreditation, such as that provided by NEBOSH qualifications. Operators need a guarantee that this person, who they have never seen before, can do the job properly without putting their installation and the rest of the workforce at risk. “Regulators are also increasingly interested in demonstrable competence as a risk barrier, using independent bodies which they recognise to assure that demonstration. Operators need to work with these bodies to ensure that the competence requirements being set test against the work that needs to be done. Oil and gas safety is a huge topic. There are of course many more aspects than the three Cs that must be considered. When it comes to avoiding the kind of catastrophe that blights the industry every two or three years and that can lead to large losses of life, major injuries, long term suffering and environmental pollution, the three Cs are an excellent place to start. Ensuring that compliance, critical issues and competence are all in order will considerably reduce risk. Risk can be thought of in terms of frequency and severity. As we’ve seen severe incidents in oil and gas can be both relatively frequent and very damaging. Let’s limit how often they happen and do everything we can to minimise their impact by identifying our hazards, assessing the risks that they pose, and using control and recovery measures to manage them.